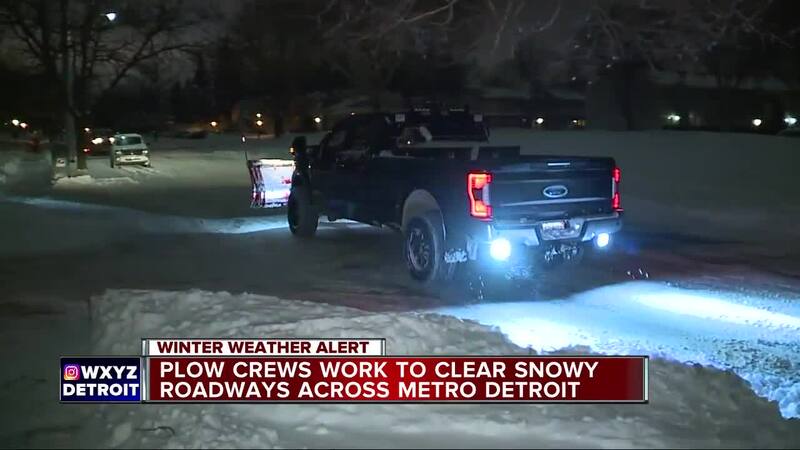 DETROIT (WXYZ) — While some did everything they could to avoid driving on snow-filled roads, others braved the elements to enjoy their Saturday night. “We had tickets and wanted to come and have a good time,” said Jamie Reigal, a Walled Lake native. He and his friend Aaron Link went to the Detroit Pistons game at Little Caesars Arena. “It’s worse than I thought it would, that includes the whole day like I thought it wouldn’t be too bad today but it was pretty nasty most of the day,” Link said. Others were busy at work, like Mike Belbot. He owns his own snow plowing business, Belbot Services, and says this is the first time in 10 years he has had to wait this long to get to work. That being said, this weekend's winter storm is keeping him busy. “With the wind being the way it is tonight, there’s going to be a lot of drifts everywhere, so we will have to go back through and check everything, make sure everything is safe for everybody,” Belbot said. Detroit Public Works is also keeping busy. They tell 7 Action News they will have between 50 to 60 snowplow drivers clearing the roads. They plan on working over the next 24 hours to make sure all major roadways are clear. Belbot said he will also be working into the late hours of the night. “We started about 10 o’clock this morning and we will keep going until everything is done,” he said.